How perfect is this cupcake tower/cake? I'm in love! 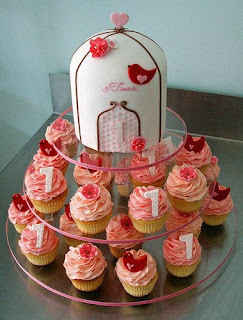 So very sweet for a 1st birthday, but would be perfect for a wedding (or any other occasion for that matter), as well! STUNNING! Oh my goodness, how am I going to now convince my daughter to have a bird party rather than a purple rabbit party??? Dilemma! the cage cake topper is beautiful! I thought you might like this summer dinner party at goodsunshine.blogspot.com but I couldn't find an email for you... here is the full link.